‘She can’t do Addition,’ the Red Queen interrupted. As January turns into February, I decided to post some favorites from the past few weeks. It's a bit late for Chloris's meme, and in no way do the flowers add up to ten, or even five, or any other official-looking sum. But the idea was certainly sparked by the Ten Favorites at The Blooming Garden. 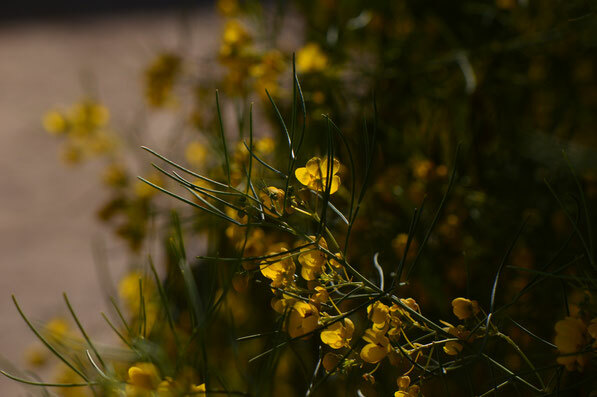 First, the most characteristic plant for January in this garden: Senna nemophila, now grown to some seven feet tall - a lace of yellow bloom, pale green stems and dangling pods, the last because, unlike in previous years, it has already been blooming for well over a month. 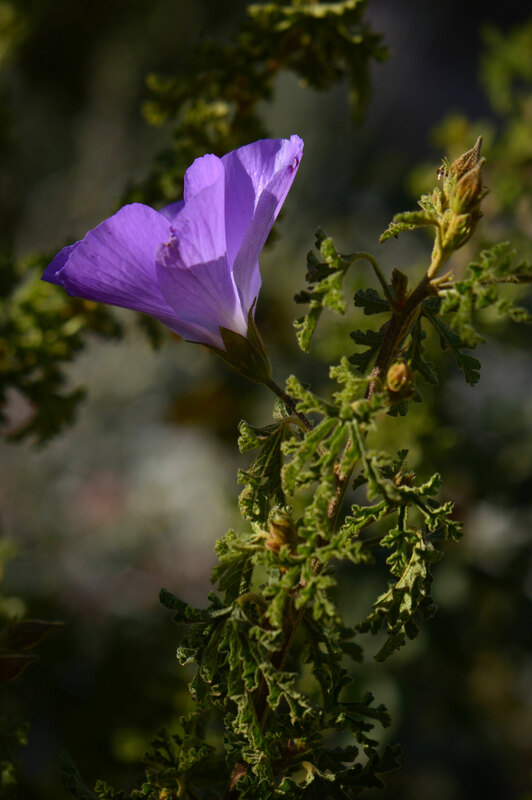 Then there is the singular beauty of Alyogyne huegelii, close kindred with the more usual brilliant pink and red hibiscus, but a celestial purple-blue. 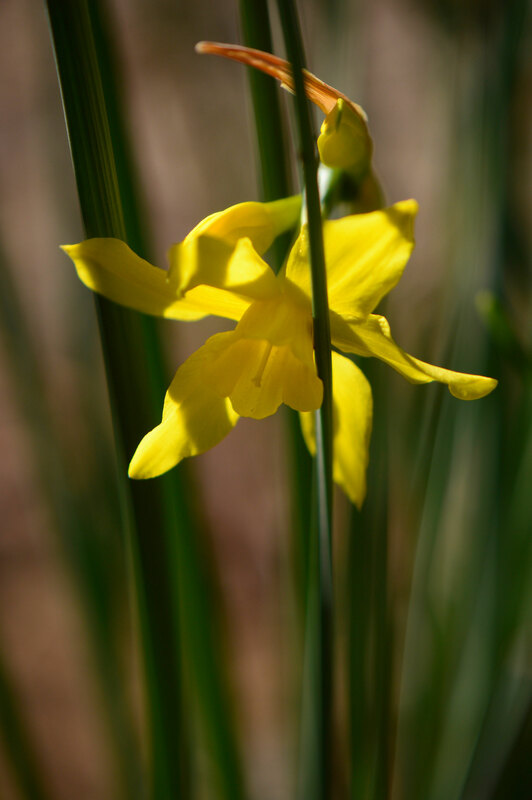 There are two varieties of narcissus in bloom at present. One is the "good scent Avalanche cross" featured in my last post (background supplied brilliantly by Tagetes x "Gold Medal"). The other is Narcissus x odorus, with color similar to the old Queen Anne's Double Jonquil (Naricissus x odorus plenus), but blooms of a delightfully wispy single form. Calliandra californica "Baja Red" features all too seldom in my posts, mostly because it receives too much shade (yes, seriously!) in the very center of the Central Bed, leaving it gangly and rather spare of flowers. 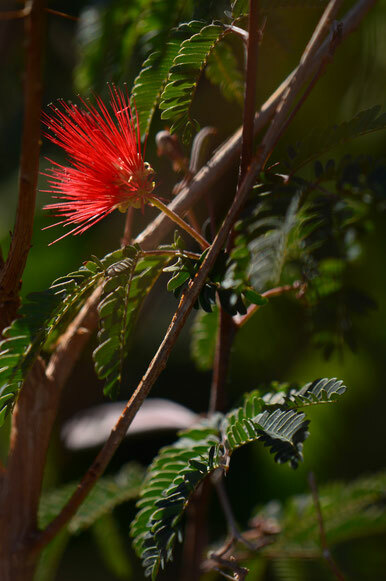 But it is doing its best to flower despite adverse conditions, and its brilliant brushes are worthy of mention this month. 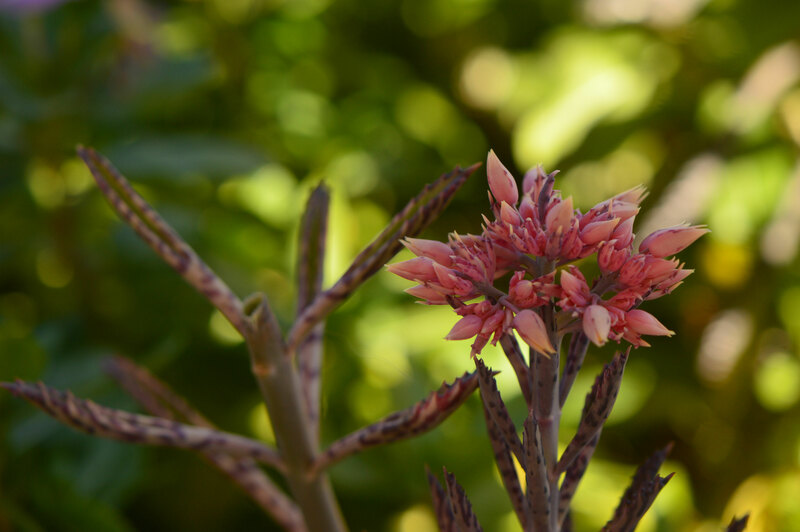 A big surprise this winter has been the arrival of flowering stalks on Kalanchoe x "Pink Butterflies", and the beauty of their flowers. The best went into my last vase, but altogether it makes a unexpectedly pleasant addition to bloom in the south border - not just for its foliage, as I supposed when I planted it out. Lastly, the deep crimson flowers of a simple Pelargonium peltatum, blooming freely beneath the autumn colored leaves of Hamelia patens. It's a combination I am liking surprisingly well, especially when combined with nearby Salvia farinacea (not visible). I love the Kalanchoe bloom, Amy! I've got a few of those plants but none of mine have bloomed. I'm glad to see that the Pelargonium peltatum is doing so well for you too. It looks as though your temperatures are still lower than ours - what's up with that?! 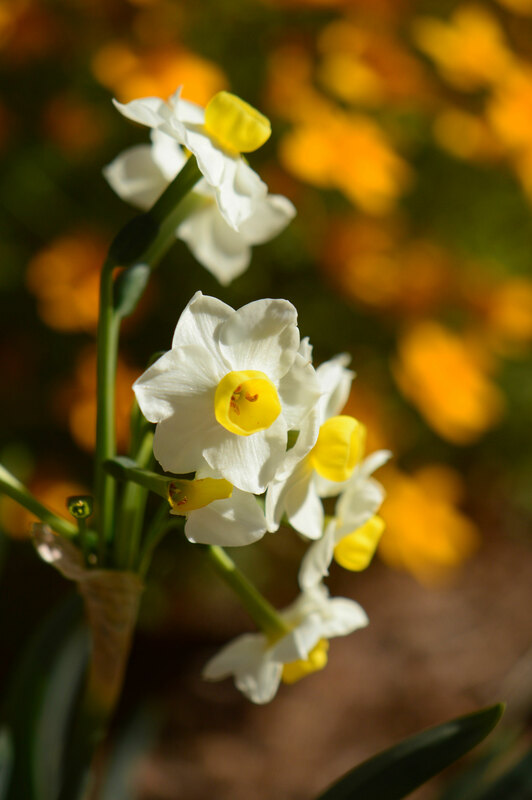 The photo of the narcissi with the tagetes in the background is pure sunshine! 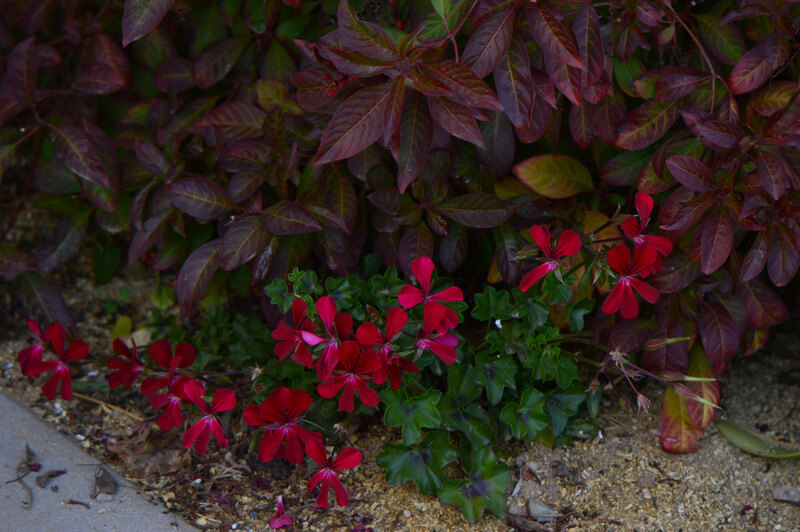 And I love that combination with the pelargonium too - I like red with dark foliage to compliment it, as I discovered when I grew Ricinus a couple of years ago. It seems peculiar to me to see narcissi in the company of more obviously hot climate plants. When our own warm weather arrives (it does, allegedly) it dries up the flowers making them short lived. Do you position the bulbs in a relatively cool spot or plant them in a special compost mix? Whatever, the blend is paradise, Amy. 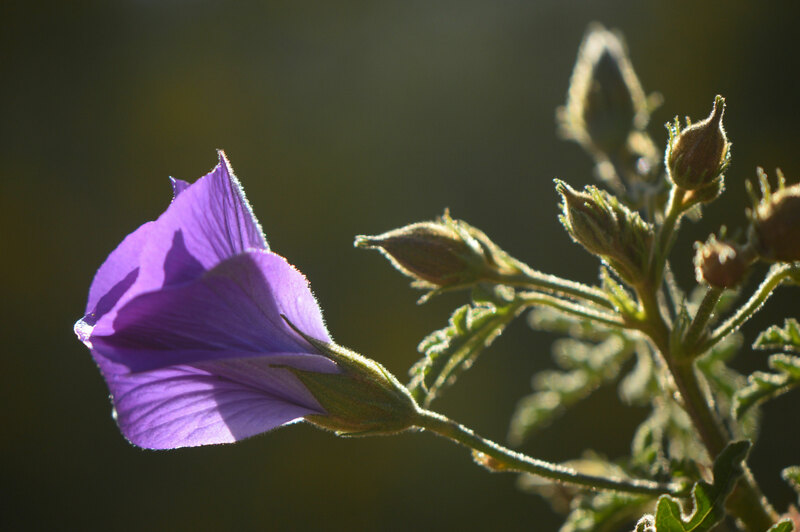 Your purple hibiscus looks a glamorous cousin to my wild soft pink one. Cathy - I totally agree about red flowers and dark foliage! :) That Tagetes is a real show-stopper, but it blends well with plants around it, fortunately. Thanks so much! Ian - Most of my narcissi are in the heavier soil, well amended with compost, at the bottom of the garden. Because of our mild winters, I've had some varieties in bloom since December, and the early ones were quite long-lasting. Now that days are warmer, individual blooms are indeed drying out quickly. But the "Avalanche cross" has a fairly protected spot and the flowers are really very substantial - more the picture shows - so they're lasting a little better. That is one variety I'd be happy to have more of! Diana - It really is a very glamorous plant - one of those marvelous Australian species that move so comfortably into my low desert climate. The garden here would be much poorer without them! Thank you so much for posting your favourite blooms Amy. 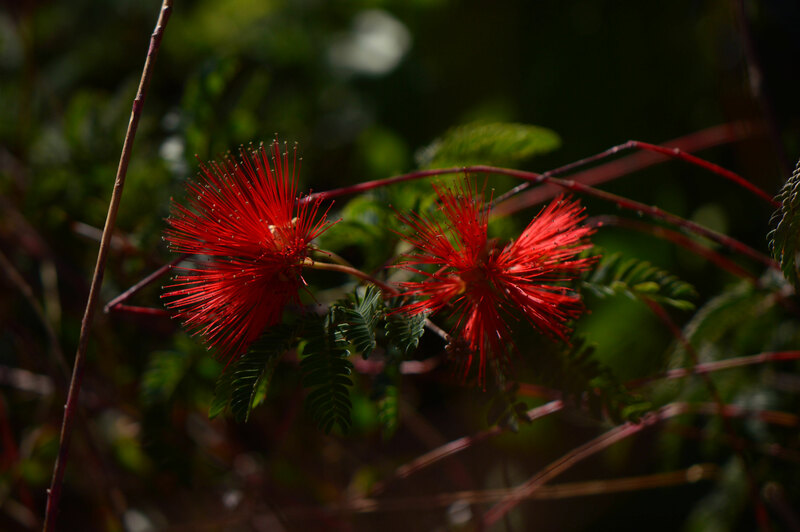 I love the calliandra. I have tried growing lovely alyogyne in a pot but I can't keep it. You have 2 very choice narcissus. Lovely photos. The Hameila is a plant unknown to me, it does though, as you say compliment the pelargoniums. I do like dark foliage plants for contrast in a border. Thank you so much, Chloris! This particular Alyogyne has been very vigorous - it does seem to be the right plant for the place as it's tolerant of drought, heat, and clay. I wish it were more widely adapted as it's such a beauty. Just Googled 'Avalanche cross'. Very fragrant and your own site comes up more than once. Never heard of them. I have now.